Cameron Boxer’s life revolves around playing endless amounts of video games in his basement training for the infamous Rule the World gaming competition with his best friends, like any good slackers should. However, Cam’s perfect ‘lifestyle’ lands him in hot water when he forgets to take the ziti out of his oven and nearly burns his house down. To appease his parents and convince them he’s doing something else with his life besides video games, Cam starts a fake school club called the Positive Action Group, or the P.A.G., with the help of his best friends, Chuck and Pavel. Everything’s going great and no one suspects a thing till the school guidance counselor and a bunch of kids who actually care get involved with the phony club. Suddenly, everyone in school is a part of the P.A.G. and the only person who seems to not care about it is the founder himself, Cam Boxer. But when the P.A.G. gets shut down due to a series of suspicous events involving good deeds turned bad and the Friends of Fuzzy high school club, can Cam turn things around, win the Rule the World competition, and find a home for Elvis the beaver in the midst of it all? I really enjoyed this book; it was funny with a good plot and relatable characters. It was written from multiple characters’ point of views which I always find interesting. I recommend this book if you have read and liked any of Gordon Korman’s other funny books! 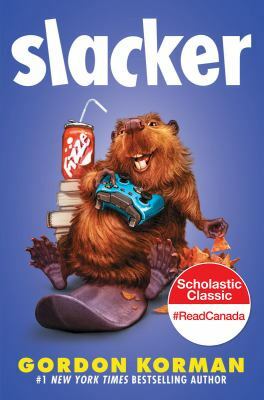 Gordon Korman’s Slacker is available for checkout from the Mission Viejo Library. This entry was posted in Book Reviews by kotlcbooklover. Bookmark the permalink.